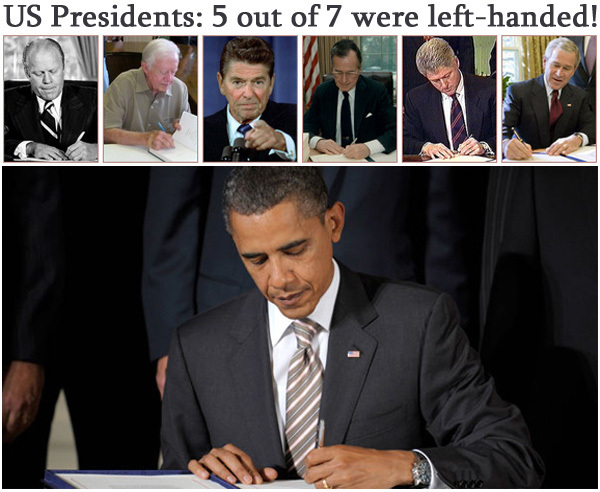 LEFT-HANDED US PRESIDENTS - Barack Obama is the 7th left-handed US president! 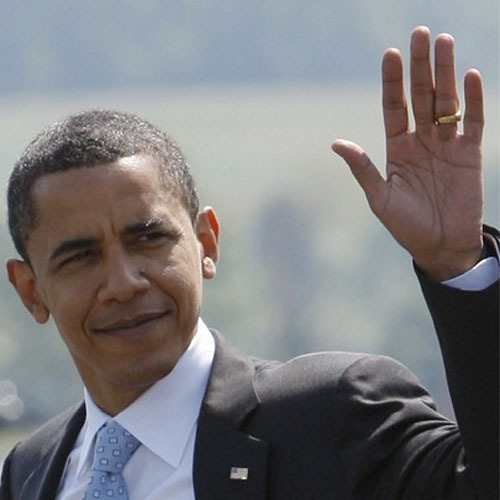 Barack Obama is the 7th left-handed US president, will the 'lefties' win again in 2012? During the past 40 years five out of 7 US presidential elections were won by 'lefties' - including: Gerald Ford, Ronald Reagan, George H.W. 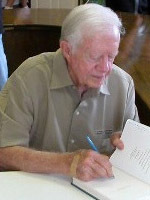 Bush, Bill Clinton & Barack Obama; during the past 4 decades there were only two right-handed US presidents: Jimmy Carter & George W. Bush were 'righties'! 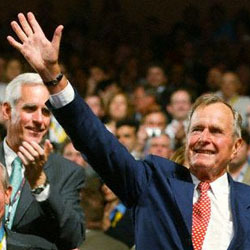 In 1992 and 1996 all three presidential nomenies were 'lefties'. 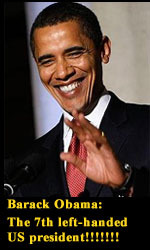 What will 2012 bring: will the 'lefty' (Barack Obama) beat the 'righty' (Mitt Romney) again? The photos below show that Barack Obama (who will become the 44th US president), Bill Clinton, George H.W. 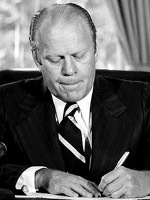 Bush, and Gerald Ford are left handed 'presidential-writers'. So, there is little doubt that these four US president are 'true' lefties. The story behind Ronald Reagan's left-handedness is far more complicated. 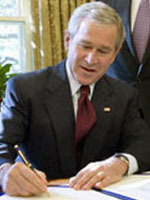 For, Reagan usually wrote with his right hand! 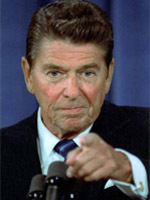 However, in his movie 'The Killers' (1964), Reagan slaps Angie Dickinson with his left hand, something that most left-handers would do. Interestingly, Reagan's biographer (Edmund Morris) has pointed out that in his movies Ronald Reagan usually twirled and shot pistols with his left-hand! 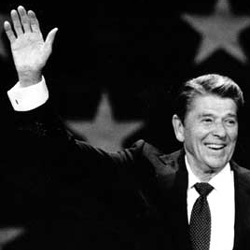 Reagan also showed the inclination to wave with his left-hand. Why does Ronald Reagan write with his right hand? This can likely be explained by the fact that in his earlier years teachers usually learned (forced) children to write with the right hand. 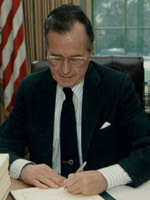 Although Herbert Hoover and Harry S. Truman are included in most left-handed lists, there is film evidence of Herbert Hoover and pictures of Harry S. Truman writing with their right hands. 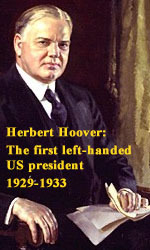 It is said that Truman first wrote left-handed as a child, but his parents made him write with his right. Going further back in time, another interesting annecdote can be told about James Garfield, who became the 20th US president in 1881 (he was murdered only 4 months later). Garfield is known as an 'ambidextrous' US president because he could write proficiently with both his right and left hand. Even more interesting is the report about Garfield that he could write simultaneously with one hand in Greek language, and with the other in Latin language. By the way, Garfield has also been reported as the only US president in history that has been employed as a "writing master" (writing masters taught students penmanship and were not uncommon during the 19th century). By the way, in these days "left-handedness" used to be considered as 'not right', merely because the word 'left' had a negative connotation in language. Some examples: In French, it's the word 'gauche', which also means awkward or improper. And in Latin, it's the word 'sinister', which we take to mean evil or unlucky. 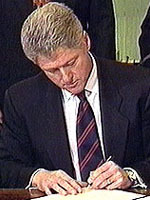 After in 1992 and 1996 the presidential office was competed by 3 lefties (1992: Bill Clinton, George H.W. 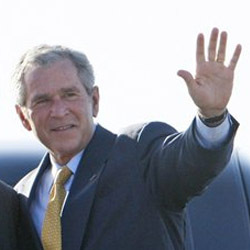 Bush & Ross Perot; 1996: Bill Clinton, Bob Dole & Ross Perot), a likewise situation occured in 2008 when two 'lefties' competed for the presidentical office: Barack Obama and John McCain. WHY ... ARE SO MANY US PRESIDENTS LEFT-HANDED? Firstly, it might be interesting to take notice of the fact that in the history of science quite a few of the high-performers were 'lefties', famous examples are: Albert Einstein, Isaac Newton, Leonardo da Vinci, and Michelangelo. Second, it is also interesting to take notice of the fact that officials in Mensa (the high-performers IQ club) believe that as many as 20% of their members are left handed - while in general population usually only about 10% of people is left handed. Third, last year the long-suspected genetic component was found. Scientists at Oxford University have linked left-handedness with the LRRTM1 gene, which appears to increase the odds of being left-handed. 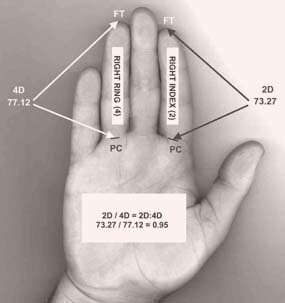 Earlier this year scientists from the University of Melbourne have reported that there is another hand-feature which appears to be linked with 'left-handedness': John T. Manning's 2D:4D digit ratio (the ratio between the length of your index- and ring finger). Left handed subjects appeared to have a more 'masculine pattern': they had a lower 2D:4D ratio compared to right-handed subjects. This finding is especially interesting in the perspective of the theory published in 2004 (New Scientist) which describes that 'left-handedness' may be related to an overabundance of testosterone in the womb. For, Manning has presented some evidence that a low 2D:4D digit ratio is related to an overabundance of testosterone in the womb as well! The photos of the US presidents below indicate that at least some of the left handed presidents have a rather remarkable 'low digit ratio'. 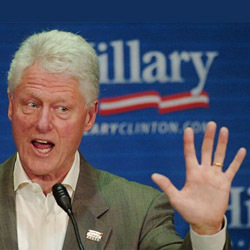 The science of 'digit ratio' can learn us that this low 2D:4D digit ratio might explain a significant aspect of their aptitude and assertiveness to become a presidential high-performer. especially take notice of the 'lefties': Barack Obama & Ronald Reagan. Left-handed people are more intelligent and creative! August 13, 2015 is unofficial the 40th left handers day! The hand of Barack Obama: a tribute to his hands!